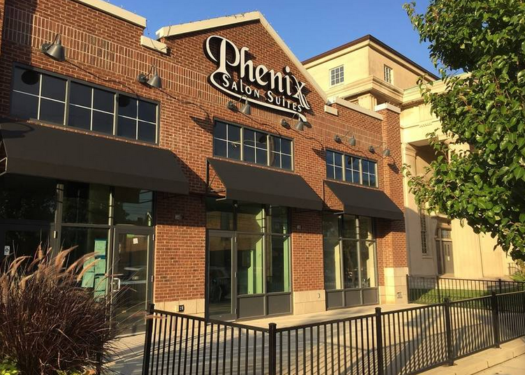 Just after six months of announcing its investment, Phenix Salon Suites is to open this October on Detroit Ave. The company is being built where Quaker Steak and Lube used to be located at. The purpose of the company is to give independent hair stylists their own business. “[Phenix] is a big salon, a big spa, in one sense. In another sense, it’s a very small one. You have individual salon owners that are starting their businesses, or growing their businesses. We’re fostering entrepreneurship in that sense. We’re giving people a chance to start their business in a safe space,” Brian Miller, Phenix’s managing partner, said. Miller announced that the business would open somewhere in September, but was delayed due to minor construction. “The construction process has been good. It’s been a lot of work, but nothing has been a huge surprise. There’s been good quality work done,” he said. “It’s a very calm, relaxed but upscale feel to things on the interior. It leads with a pretty dramatic water feature at the entry. There are light sconces in the hallways that add to that upscale feel,” Miller said. He then noted that, “individual suites can feel very different because each stylist can decorate them however they want. It’s a very unique company that gives inspiring hairstylist the chance to have their own little salon suite. They can lease space within Phenix and occupy their own private suite.The stylists build their own customer base and keep building their brand gradually. There are 33 suites inside Phenix Salon Suites. Company leaders say that there isn’t a grand opening in the plans yet, but there may be one held in the future. Remodeling on the former restaurant is almost complete, with just inspections remaining left until the opening of the salon. Miller was very ecstatic to talk about the opening of his new business. Many Lakewood residents seem to be excited to try out the new salon. “What they can expect is a variety of salon services. It’s everything from hair stylists to massage therapists to nail techs, to skin care, Microblading, it’s full service. It’s all independent small business owners, a lot of them local to Lakewood that are starting their business with us,” he said in an interview with Lakewood Patch. “It sounds really cool and interesting. I’ll have to go and try it out sometime!” – Rachel Owen, LHS senior.